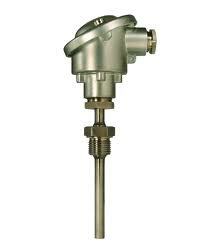 Resistance Temperature Detectors or RTDs are sensors which measure the temperature by altering their resistance. > The Resistance temperature detector consists of an element made of a metal such as platinum located in a metallic casing. When the temperature increases, the resistance of the sensor increases (positive temperature coefficient of resistance) This increase in the resistance is measured through a wheatstone bridge. The relationship between temperature and the resistance is linear. Thus, the temperature can be deduced from the measured resistance. Platinum and Nickel are two metals used to construct the sensing elements. Some common types of RTDs are the Pt-100 and Pt-1000. The Pt stands for Platinum while the number 100 stands for the ohmic value at 0 degrees Celsius. The resistance increases linearly with temperature.